So, you’re ready to make Organic Cheetos and Spherified DRY Lavender Soda Bellinis, but you can’t seem to find sodium alginate and calcium chloride at the neighborhood market. Don’t worry – you’re not alone. Luckily, there are a number of online suppliers who can easily fill the “Modernist” shelf of your spice rack. Here are a few of the better sites for finding tools and ingredients for your foray into future food. http://www.lepicerie.com – a huge collection of spices, flavorings, additives and tools. Sold in small and large quantities. http://chefrubber.com/ – targeted at pastry chefs, they carry a wide variety of molds and confectionary tools, as well as serving pieces and and decorating supplies. http://www.le-sanctuaire.com/ – a full line of molecular gastronomy chemicals, as well as a very impressive collection of tableware and specialty foods. http://www.dcduby.com/ – For our Canadian friends, they carry a relatively complete selection of molecular gastronomy ingredients. http://www.tienda.com/ – Carries the complete line of Texturas products. This is the brand created by Ferran Adriá, and offers accompanying recipes for use. Although convenient, you pay a premium for the brand name. WillPowder (via Amazon.com) – Great prices on large quantities (1 lb.) 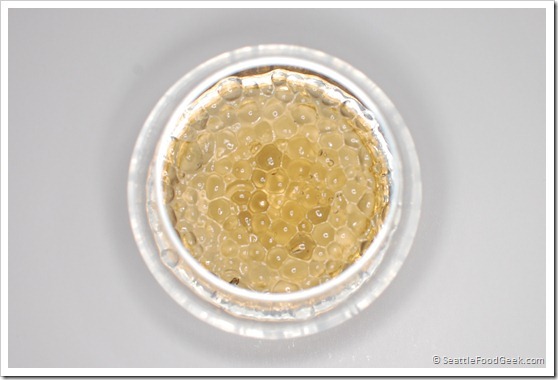 of common molecular gastronomy chemicals. Next-day delivery available through Amazon. Additionally, the fantastic blog Alinea at Home has put together a spreadsheet of hydrocolloid sources. If you’ve found a great supplier for chemicals or tools, please leave a link in the comments! 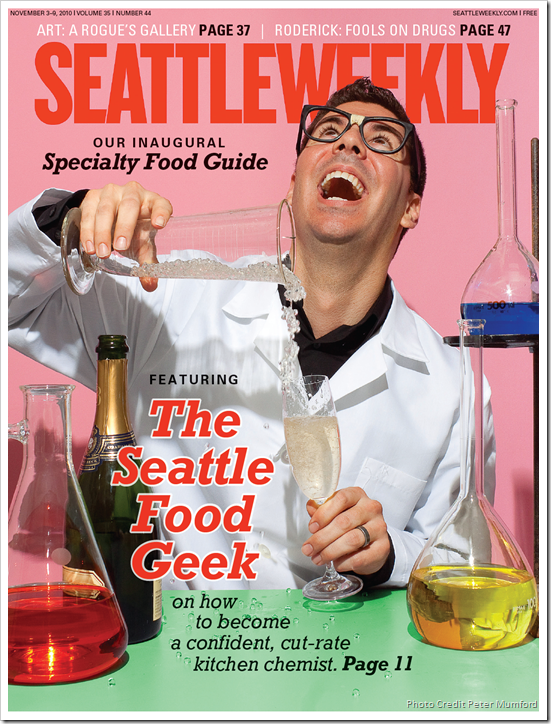 Seattle Weekly ran its first-ever specialty foods guide this week and I was honored to be featured on the cover! Head over to www.SeattleWeekly.com to check out the contents. You might learn some new tips and tricks! After the previous round of experiments, I assumed that the source of my problems was the water itself. 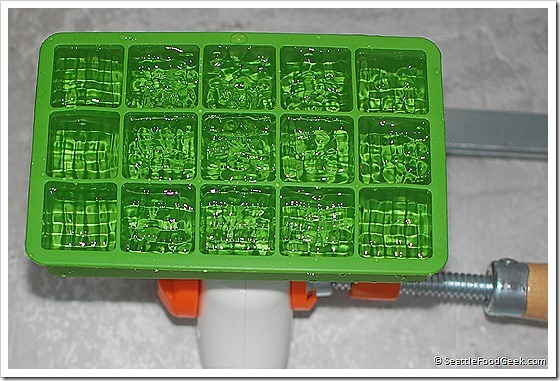 Several folks left comments suggesting that only distilled water will yield clear ice, and tap water or filtered water was simply too impure. So, I grabbed a bottle of distilled Arrowhead water and tried freezing it. Fail. Then I tried boiling twice it and freezing it. Fail. Then, I came up with another idea… a radical idea.